Many of us would love to get rid of those pesky "orange peel" dimples known as "cellulite." Cellulite is made up of fat deposits that present with a lumpy, dimpled skin appearance, mostly on the hips, thighs and/or buttocks. It is the result of rigid fibers within the cell chambers. When the fat cells are enlarged, these fibers are pushed towards the soft tissue of the skin. This creates a dimpled skin appearance. The causes of cellulite include heredity, smoking, hormones, lack of exercise and poor dietary intake, which includes high fat foods and drinking alcohol. Cellulite is extremely common; 80 percent of women over 20 years old, regardless of their weight or body size, have some cellulite. Even slender celebrities like Britney Spears and Halle Berry have cellulite, as evidenced by many photos of them in their bathing suits. Luckily, there are treatments available to all, not just to celebrities, which target cellulite. VelaShape is a relatively new, non-surgical technology that incorporates Bi-Polar Radiofrequency (RF) and Infrared Light Energy with vacuum. It also utilizes mechanical massage. This combination treatment contours, shapes and slims the body by reducing cellulite and firming up the most challenging areas. VelaShape is both a body shaping and cellulite reducing treatment. It is most often used on the thighs, buttocks, love handles and abdomen. Stage 1: No dimpling will when standing or lying. A pinch test produces dimpled skin. Stage 2: Dimpling skin spontaneously appears when standing but not lying. Stage 3: Dimpled skin spontaneously appears when standing up or lying. Gradual smoothing of the skin’s surface and noticeable reduction of cellulite is the main goal and result of VelaShape treatments. There is circumferential reduction that creates reshaping of the treated area. The statistics show that 85 percent of treated areas on thighs result in at least 1 cm-7.2 cm, circumferential reduction. The results are temporary, lasting 3 to 4 months. Cellulite will return if VelaShape treatments are stopped. The FDA has approved the VelaShape procedure and supports the results. 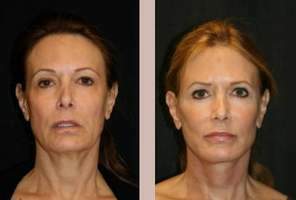 Patients are generally pleased with the end result of VelaShape in as few as six treatments.